After a while I have come back to detailed research of reiki as the seasoned guy, who is getting know and practices this system almost 15 years. This time we started more detailed reiki research and we surprisingly created a new perspective on this issue. Let me introduce reiki system and its potential possibilities. It is a well-known system of healing. The system of reiki as healing yourself. The system of reiki as meditation and spiritual way, which is inserted inside neurons without the need to study this, understand and exercise. Reiki connected to the Indian tradition of chakra yoga. Tibetan Reiki based on the preservation memories after the death of the meditation person. Reiki linked to Ayurvedic techniques of opening and healing of blocked nerves and neurons from infancy. He is considered in the modern history of Eastern directions as the founder of Reiki outside the circle of insiders. It was the dedication of military doctors in Japanese army, therefore, for the first time outside the circle of selected esoteric persons. Of course, reiki has its roots and its founders first in India and then in Tibet, China and later in Japan. Mikao Usuiho can not be considered as the first founder who practised reiki. But it´s not important who was first. It is clear that consecrated persons transferred the reiki system outside the Asian world and brought it to the United States and from there it was spread to the whole world and this is significant. Reiki history started in India. This history is linked to the fact that Indians have permanently open sexual consciousness and not sometimes open and sometimes closed like European people have and you should be well aware of this. Europeans may have the status of sexuality and asexuality. Indians have only condition of sexuality, so there are some differences. Important is also the point that Indian culture ensures permanently open neurons from embryonic development through their old religious and meditation traditions. In European culture it is unfortunately so that neurons and nervous system from embryonic period is blocked in the adult individual and that is a problem for the adoption of the original Reiki which it is known in Asia. In India and in other Asian countries as the right man for the initiates is considered the person who has pieces of the twin throughout the body and it is assumed that this level represents Buddha and his followers. We examined records of individuals like Buddha and his followers by oracle techniques and we clearly found that they contain remains of twins. Mikao Usui was having something like that. Even twin and his pieces grew up over his body to the size of a newborn and something more. Mikao Usui was consciously associated with the twin, who lived inside him and that’s the uniqueness that gives reiki system excellence. Such persons had an excellent effect on Indians and they gave them lots of initiations directly in their neurons and they influenced diseases and the overall fate of individuals. It is important to look where Japanese Mikao Usui lived and especially a detailed look at videos and pictures of his burial place and his remains. If you are skilled and proficient sensible person, then start at his burial place where his posthumous record can be perceived in the world of the dead. For his perception you need to have a row of exercise clinical death. His posthumous record (memories preserved after death in the world of the dead) is thick and well preserved. Under what circumstances you could get consecration directly from Mikao Usui? And is this even possible? It is possible immediately, if you have structures of embryonic twin inside your body. And you will not probably have it and therefore you can not get the consecration directly. Question is also if you can get the consecration of all successors of Buddha? Sasa Pueblo was researching this problem many years and he was looking for a way to get it despite the fact that you do not have structures of the twin inside yourself. 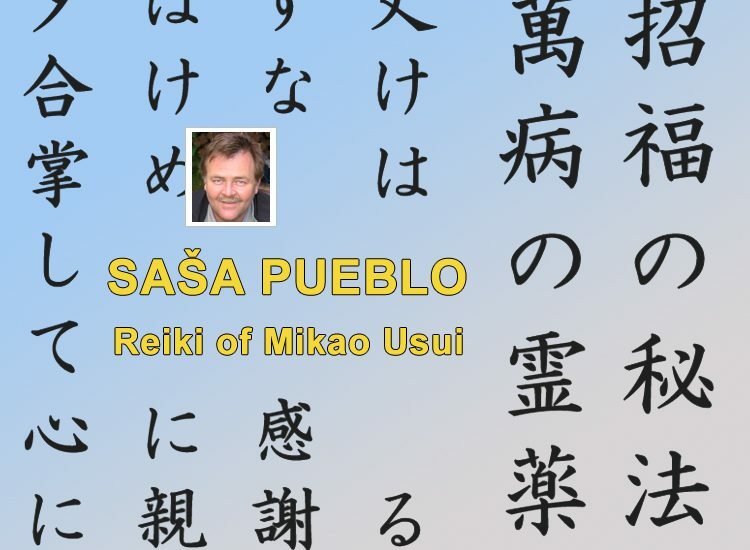 Sasa Pueblo is able to convey to you at a distance this consecration and the consecration of others who were before Mikao Usui. If Reiki practicioner wants to get inside the brain of American and European people he can not do this through embryonic nerve and neural pathways but he transfers this consecration through the surface of the skin and straight through sensors and nerve endings of the skin. Thus, through nerve sensors for heat, cold, pressure and pain. The strength of reiki consecration is outside the embryonic nerves and neurons which are strongly represented in 8 layers of the skin. Sasa Pueblo had to dispose very often these kinds of consecration, because they do inconvenience in the psyche instead of healing. Right reiki consecration has to be directed into blocked embryonic nerves and neurons precisely in the skin. And then reiki initiation must be done a little differently than in the Asian population. Whole consecration requires oracular performance. While performing consecration, it is necessary to find out, using oracular methods developed in the brain of the person who is providing the consecration, how deep in man are blocked nerve and neural pathways which remained from embryonic period and infancy. Body structures from childhood such as neurons and neural pathways are within the aging of the body not destroyed, but blocked, sealed and closed. People in India are trying to have them open through the meditation and spiritual religion. Tibetan Buddhists in India, Tibet, Mongolia, Bhutan, Japan and even China have improved this system to the system of mandalas: monastery mandala, mandala grave, sprinkled mandala, even they live in the mandala. These techniques keep more intensively opened embryonic and children’s structures and they use them to healing and also to preserve memories of persons after their death. These memories are inserted inside of living people as a spiritual value. Monks and residents are concentrated in buddhist monasteries within the system of mandalas. And in addition there is no civilization and Internet near. Research in this direction is clear. By opening embryonic and children neurons you get a system recovery using stem cells from different parts of the body, especially from fat cells. In China is a good resource for opening blocked neuronal and neural structures sponge Hericium erinaceus. We personally tested and by use of oracular techniques we verified the effectiveness of this fungus. If you have unblocked the embryonic consciousness, your body renews and regenerates through stem cells. Since all this happens in the skin, then the skin is also a way to repair digestion, if you are taking certain medications and nutritional supplements through the skin (spread those supplements on the skin). And in old age is not negligible an direct nutrition through the skin. We can get the amount of knowledge into the brain through opened embryonic structures without practicing for many years and this is not bad. And through embryonic structures could be built structures which correspond to what is after death and that is the system of preservation memories and to program them to a particular activity, even after death. Mikao Usui reiki is not only about the consecration. Some people may use this type of reiki as the way of the meditation which they practice several times a day. And then this is typical how it was for Mikao Usui, reiki as meditation rather than as the reiki consecration. And then here is a number of techniques, which are based primarily on watching many videos about India, China, Tibet and Japan. And so achieve states of Mikao Usui also through a large volume of videos. It could be also a music from these places. Then there are the basic concentration on chakra points on the body and also a strong concentration into embryonic structures. We open them through meditations on everything around chakras and mandalas. Then there are techniques as the concentration on everything what is hollow and also our body. The concentration of something in something like a duck in a bottle or a bottle in the duck. Typical is Zen meditation. Alternatively the ability to move the pendulum in the closed bottle. We tested in detail living persons who have pieces of twins or triplets inside. And this is live persons and not a records of these persons in magnetic fields of the planet Earth. And it is interesting consecration remotely. And if nothing else, at least respect for such persons and their unique status.